Race is a social fiction imposed by the powerful on those they wish to control. Matt was trying to do me a favor. He was trying to introduce me to the very bizarre and peculiar rules that we all know as grownups — very important things to understand. If you didn’t understand them, you’d find American life and society very strange. You’d do things you shouldn’t do, go places you shouldn’t go. You’d mess up if you didn’t understand the particular rules that govern the ideology of race in the United States. The whole idea of this talk — if you take away nothing else — is this: the whole thing is made up. That’s it. And you can make it up different ways; and people have and do. And it changes. And it has nothing to do with biology or genetics. There’s a study of several decades of census records that found that twice as many people who call themselves white have recent African ancestry as people who call themselves black. One thing we often forget about that case is that Homer Plessy’s argument was that he was white! He got bounced from the white section because the conductor said he was black. The question wasn’t that all train passengers should be able to sit together, rather Plessy said, “No, I’m a white person, actually.” The court admitted that it was very important to be able to determine who was white and who was not, and that having the ability to be white is a form of property, that it’s valuable, extremely valuable, in 1896. A White person has been held to include an Armenian born in Asiatic Turkey, a person of but one-sixteenth Indian blood, and a Syrian, but not to include Afghans, American Indians, Chinese, Filipinos, Hawaiians, Hindus, Japanese, Koreans, negroes; nor does white person include a person having one fourth of African blood, a person in whom Malay blood predominates, a person whose father was a German and whose mother was a Japanese, a person whose father was a white Canadian and whose mother was an Indian woman, or a person whose mother was a Chinese and whose father was the son of a Portuguese father and a Chinese mother. You know . . . white people! Human beings that look the way we do evolved around two hundred thousand years ago in the African continent and began leaving it around seventy-five to fifty thousand years ago. They settled in various parts of the globe and in bands of people that were, for the most part, cut off from each other. So there is a biological basis to the reason people look differently from each other. And if you look at those people before the modern era of tremendous transportation, of people going all over the place for political reasons, of people being carved up geographically into nations — all things that are pretty much brand new in human history — the people that settled around the band of the equator, where they get the most intense direct sunlight, all over the earth, those people have darker complexions. Now why is that? All human beings, regardless of their complexion, have the ability to produce melanin as a protection from UV radiation. If you are fair skinned and subject to intense direct sunlight for prolonged periods you are likely to develop skin cancer. Skin cancer might not stop you from reproducing (and therefore passing on your genetic material) because in general you’re going to develop that when you’re older. But if you’re one of those people who has been living for thousands of years in regions far from the equator, regions of scarce or indirect sunlight, you have a different problem — the problem of Vitamin D deficiency. The sun is a crucial source of Vitamin D for humans, so you’re going to have illnesses associated with Vitamin D deficiency. You actually need to absorb more sunlight, and so paler skin is advantageous in those places. This is important because scientists have certainly tried for a long time to prove that there are different races, and it’s all been disproven. It’s bunk. Today we even understand that there is more genetic diversity within the so-called races than between them. When we turn to the racial category ‘Black’, we find enormous geographic and human variability — Africa has deserts, mountains, oceans, tropical areas, and spans a range of latitudes, some distant from the equator. It has hundreds, if not thousands, of linguistically, culturally, politically, and historically distinct populations. Africa is home to the shortest and the tallest people of the world. Other traits vary significantly, including skin color, facial traits (nose, eye shape), overall body shapes, even the frequency of sickle cell and lactose intolerance. There are a few traits that are like that, actually — discrete traits where you either have one thing or the other. Earwax is one of those things, there’s only two types; you either have sticky or wet. But we’re not likely to see a sticky-earwax civil rights movement anytime soon. Or a Wet Earwax Party for Self Defense. Here’s a thumbnail sketch of the history of the invention of “race.” Race is a new development. If human history were a two hundred page book, “race” begins on the last line of the last sentence of the last page. And it starts here, in the United States. First the European colonists tried to press native people into this labor, but that failed — the native people were on their home turf, they knew the land better, and they could escape. Native Americans were not a reliable source of the kind of intense labor power the Virginia colonists needed. And these Virginia settlers were not producing the tobacco to smoke it, but rather for someone to smoke it that they’d never see. This is production for a world market, at the pace of the world market, for unseen tobacco consumers thousands of miles away. So this is the origin of alienated commodity production on a mass scale. Africans existed in many different conditions in the colonies. Some Africans were free; there are even instances of Africans bringing lawsuits against Europeans — then called “Christians” — and winning. There are records of Africans adopting Christian babies. It’s only later that language changes from “free” and “slave” (or “African” and “Christian”) to “white” and “black.” Africans were available for enslavement in ways that other people were not. For the first time in human history, the color of one’s skin had a political significance. It never had a political significance before. Now there was a reason to assign a political significance to dark skin — it’s an ingenious way to brand someone as a slave. It’s a brand that they can never wash off, that they can never erase, that they can never run away from. There’s no way out. That’s the ingeniousness of using skin color as a mark of degradation, as a mark of slavery. Of course, it’s crucial to understand this is not an uncomplicated history. This was not a socialist revolution — one of the insurgents’ principal grievances was that the governor wasn’t killing Indians and clearing land fast enough! But the fact that the planters faced a united opposition from laboring people shows that the ideology of race was not natural or automatic. While this color line was being drawn very decisively in the United States — and I should point out, for a very practical reason, because it made it easier for the planter elite to divide and control both camps — the color line was being drawn differently in other places that used African slaves. This occurred for a simple reason — in other slave societies, specifically in the Caribbean, there were not enough “white” people to govern the black slaves. Read, for example, Ta-Nehisi Coates’ piece in the Atlantic — he goes through Jim Crow, housing segregation, all of the ways that people have been legally robbed in this country. Also Michelle Alexander’s argument in The New Jim Crow: Mass Incarceration in the Age of Colorblindness is very compelling. She argues that today, without using the language of “white” and “black,” there’s a new system of trapping people with felony convictions, which disenfranchise black people on a mass scale. In their book Racecraft: The Soul of Inequality in American Life , Barbara and Karen Fields raise some really provocative arguments that I think are important for us to grapple with. One is the idea that people often use the term “race” when what they really want to talk about is racism. When commentators emphasize “race consciousness” or “race relations,” they make something that’s about oppression into something about identity. A classic example is the tragically common refrain, “They shot him because he’s black.” We all know what that means, but actually, the sentence doesn’t make sense. Black skin doesn’t attract bullets. The color of someone’s skin does not cause them to be shot. That’s oppression that causes that to happen. That’s racism, not race. Barbara and Karen Fields use the term “racecraft,” evoking witchcraft, to describe an ideological fog, a pervasive mental terrain, in which all of this operates. One of their most provocative arguments is that well-meaning people often end up recreating the ideas of race in their attempts to be anti-racist. For example, by trying to find in ideas of race something to do with culture, or something to do with identity. 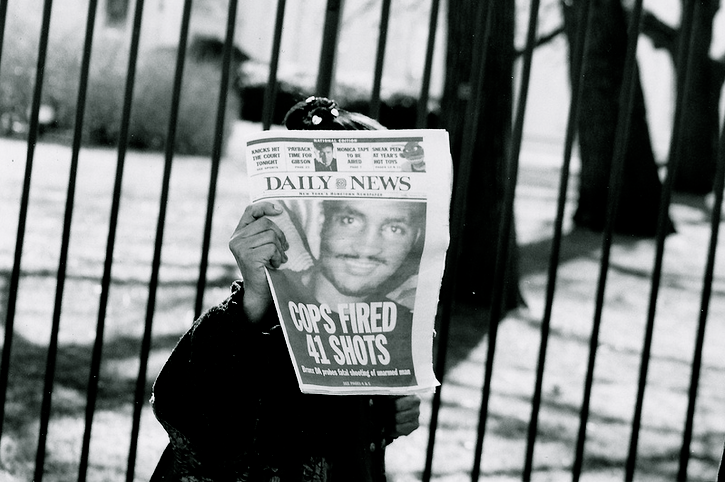 But Barbara and Karen Fields point to the example of Amadou Diallo, an immigrant from West Africa who was gunned down by New York City police in 1999. If the police had known that he was an African immigrant, and not an African-American, would they have thought he was the same kind of threat? This talk has focused on people of African descent in the United States. But once it became the dominant idea in the US, racism proved to be a highly useful ideology. Racism allows you to carve up the entire world into so-called races. And then it becomes available as an ideological framework to explain and justify wars, and to explain and justify the subjugation of all kinds of people — so-called immigrants from Mexico, for example — or to describe what the United States continues to do to its native population. And all of those racisms have particular features, dynamics, and politics that are unique to those struggles and to those contexts. It’s a highly malleable set of ideas. I want to end with a discussion of how to best confront racism today. I think fighting racism in our context has certain unique challenges. One of the challenges is that we are living on the heels on a tremendous antiracist struggle — the Civil Rights and Black Power movements — and now nearly every institution in our society swears up and down that it doesn’t discriminate. The official stance of every institution is antiracist and in favor of “diversity” and so on. But we know at the same time that all of these institutions — every university, every school, every prison — has a tremendous pattern of racial disparities: who gets punished and who gets rewarded, who gets opportunities and who doesn’t. These tremendous patterns happen at the same time as a high level of official denial. And the court has ruled again and again that the pattern isn’t enough, you have to show intent to demonstrate racism. Racism is most obvious when people are dumb enough to voice it aloud. Like that rancher and basketball team owner — if they slip up and say something racist then there’s a big hoopla. But the day in and day out racist degradation and denial of opportunities are ignored. One item of continuity between these different eras is pervasive attempt to pathologize people of African descent. Even Barack Obama has frequently played into this by talking about the parenting practices of black parents; the very fact he can do that shows the pervasiveness of the idea — it’s become common sense that there is something pathologically wrong with the culture of black people in this country. Contrast that with what happens when people of a different complexion shoot up a school (nearly every week in this country, it seems). Obama wouldn’t get on TV and say, “Tsk, tsk . . . white parents — c’mon white parents!” Obama would never do that because our society does not say that there’s something pathologically wrong with white people in the same way. Many African-Americans thinkers and left-wing intellectuals are actively engaged in thinking through how to deal with this. And there’s some debate — for example about affirmative action. On the one hand you have people like Cheryl Harris. In an article called “The Property Interest in Whiteness,” Harris describes some of the things I mentioned about the ways in which the courts have upheld whiteness as an identity that is worth something — it has real material value. And she argues that affirmative action undermines that property interest in whiteness by giving certain advantages to people of color. Coates argues something similar, that the question of reparations is important, and affirmative action is a part of that, and he says we have to be honest — giving a slot at a university to a black kid means that we are therefore not giving something to a white kid, and that’s okay because we’ve been not giving something to black kids for a long time — so how can you cry foul now? But the ideology of the new Jim Crow, is to pump up the few black success stories in order to denigrate everybody else, in order to further pathologize black people, as if to say, “If you’re not the president, then what the eff is wrong with you?” And so she argues that affirmative action (“now we’re admitting 8 black people to Harvard . . . see?”) is part of the structure of blame for everybody else. And that’s important. They ask, “Why are we saying it’s okay to just insert a few more black people into that college,” for instance, by which we sidestep the conversation about why college isn’t available to all. That assumes that there’s scarcity of college, or of jobs — that that shortage is a natural state of affairs — and leaves us with no language to talk about inequality in general. Now the caveat to all this is that the few Neanderthals who did survive from fifty thousand years ago are all on the Supreme Court. Their attack on affirmative action from the Right has nothing in common with these critiques from the Left. And we’re in a context in which those real gains (meager as they may be) are under constant attack from the Right. They’re under attack from those who use the logic of colorblindness to say, if you’re not succeeding, what’s wrong with you? That kind of colorblindness is instrumental to the new racism. I won’t pronounce a winner in this debate, but it seems to me we can take a stance that is not either-or but both-and. We want to fight for anything that is reparations-like in a way that does not assume the scarcity of opportunity to be natural, but rather calls it out as historical and artificial scarcity. Adapted from a talk delivered at the Socialism 2014 Conference in Chicago. Brian Jones is an educator and socialist in New York City. He was the Green Party’s 2014 candidate for lieutenant governor of New York.